I'm adding some new functionality into my Active Crossover Designer tools - an extension to allow the user to view the off-axis response (measurement based) of the loudspeaker, including the crossover. The idea is that the user needs to make tradeoffs or design choices based on both the on-axis response and the off axis responses. These are governed by the responses of each driver and the crossover, in terms of phase and amplitude. The extension permits all of this to be viewed during the design process. There will be two types of views available. One view contains multiple line plots, one for each angle. The other is a directivity plot, and example of which is shown below. I am currently looking for input on the format of the plot. Sorry that this one looks a little strange - I just made up some data and it is "one sided" e.g. the off-axis angle begin at 0 (e.g. on axis) and goes up to 60 degrees off axis (angle is on the y-axis of the plot). Also the max SPL of the data is about -15dB and the min SPL is about -60dB. Again, just some made up data. The angular span of the plot is completely determined by the data that the user supplies to the extension. OK, I updated the plot to look more like the familiar "symmetric about the on-axis position" directivity plot. What I am after is, compared to other directivity plots, does this one convey the typical information? Are the legends useful? Did I mention that this is available as freeware? Here is an update on the multiple line plot (waterfall plot) presentation of the data, showing what I have been able to put together from some simulated data using my extension. Note that this is different data than what I showed in the first post. 1. Present the on- and off-axis data, as measured, as a surface. 2. Present the on- and off-axis data, as a surface, but normalized by the response at the on-axis position. I've figured out how to make the 3D surface appear like a solid object. I can choose any RGB color for the surface mesh, and choose one of 16 colors for the contour lines. The lines intersect the z-axis now. Using gnuplot, you can rotate the 3D object to view it from any vantage point that you desire. This would be helpful, for instance, for looking at the "back side" of the surface, because not all off-axis responses will be symmetric about the on-axis response (angle = 0) like this one is. I personally like the sonogram better. It would be a nice feature if I could hover over the sonogram and see what the level is at the cursor position. The other way I like to see directivity is how Stereophile shows it. It's similar to your plots above, but cleaner. That would be nice, but GNUplot doesn't have this feature (hover and get value). I might be able to annotate each contour line in the plot using a text label containing the SPL level of the contour. I haven't been able to reproduce the Sterophile directivity plots exactly, but as you mentioned my 3D surface plot is a facsimile except it is "busier" with more lines. Honestly I think that my version shows the data in a way that allows you to see the SPL versus angle relationship more easily. On the plot above there is a z-axis scale, but it is difficult to discern the SPL for almost all combinations of frequency and angle. On my plot, the lines and contours make this relatively easy. Last edited by CharlieLaub; 27th August 2013 at 10:25 PM. I am zeroing in on some useful plots. The following examples are from an MTM system that I am currently working on. There are probably other types of plots that can be created from the data file using gnuplot (like the fence plot shown in a recent post in this thread) but I will stick with these for now. There is an option to create the 3D plots with the off-axis responses normalized by the on-axis response if that is desired by the user. The normalization presents the data in a slightly different way that highlights the smoothness of the responses. I have just started dabbling with ACD and already have got quite good results with my first efforts ( using a miniDSP + 15" woofer + compression driver/waveguide). I'll return to it being more careful with my measurement and blending of the FRD files and I should get even better results. Thanks for your amazing work here with the spreadsheets! As I'm also interested in the off axis directivity plots, this feature would be quite amazing to have. 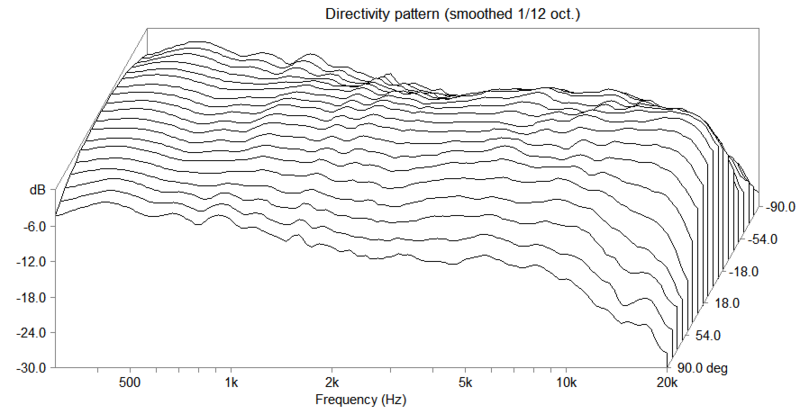 For comparison with the other directivity plots around, the sonogram heatmap would be the best graph format to support. I just happened to see your post - glad ACD is working for you. I have a bunch of new features that I am slowly gearing up to release in the next version. These will include the plots shown in post #8 as well as a new polar type that I developed with some input from Siegfried Linkwitz. The release is probably still a couple of months away, depending on how much I get prodded to work on it. See attached for an example of the polar type.